Here's a great way to save budget dollars and update your entire career library with one easy purchase. This year's edition of the Complete Career Center Kit is a comprehensive collection of today's best job and career publications all in one easy-to-order package. The Complete Career Center Kit has something for everyone. The collection now includes two hundred of our best-selling career books, directories, employment guides, colorful posters and DVDs. Vital information job seekers and students need to compete in today's highly competitive job market. Order today! 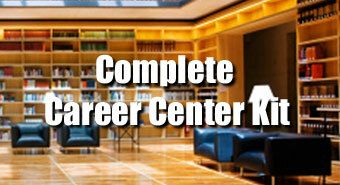 200 of Today’s Best Career, Education & Life Skills Resources Included with the Complete Career Center Kit. CCI CODE: RC501 PRICE: $2,999.00 ORDER TODAY!